The estate agent's details listed two reception rooms, kitchen and bath. What they failed to mention was the dead celebrity in the master bedroom. Personal assistant Verity Long's house hunt is about to turn into a hunt for a killer. It will take some fancy footwork to navigate the bitchy world of dance shows, television studios, and dangerously gorgeous male co-stars. 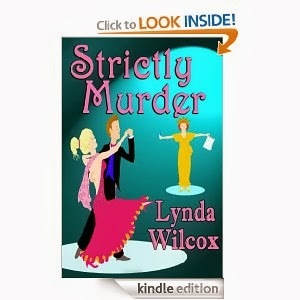 When Verity looks like the killer's next tango partner, she discovers that this dance is ... Strictly Murder. This passage is taken from Strictly Murder, the first in a series of comedy cozy mysteries starring feisty, self-opinionated amateur sleuth, Verity Long. In the excerpt, Verity is getting closer to uncovering the murderer than she realises and he decides to get rid of her once and for all, after a previous attempt on her life had failed. As we have quite a few canals here in England, and I've spent several holidays boating on them, I decided to use one in this scene, especially as it later ties in nicely with the resolution of the sub-plot. I hope you enjoy it, and it gives you a flavour of Verity's (very British) humour. I had reached the end of the shops along the high street and with it the comforting yellow glow of their neon lights. Ahead of me now lay a dark patch leading up to and over the canal bridge with the taxi office a hundred yards or so beyond that. I walked into the blackness and onto the bridge feeling the rough stone of the centuries-old parapet under my hand, hearing the lapping of water. When I reached the top I stopped, taking a moment to let my eyes adjust to the lower light levels. Above me the bright stars of the summer triangle sailed though the June night. I brought my gaze downwards, leaning on the top of the stone. It was very quiet and still. Below me a narrow boat, cabin lights barely masked by floral curtains lay moored, its ropes taut to the tow-path. I stood on tiptoe and peered over. Suddenly, everything was happening at once. I heard a pattering noise, strong hands gripped my legs, I was pitched forward and barely had time to scream out, “What the …”, before being catapulted into the inky blackness below. It wasn't a graceful dive, no forward somersault, half-pike and twist but there was definitely a degree of difficulty in it as, arms and legs flailing wildly, I cleaved the ice-cold, filthy water with all the elegance of a pregnant buffalo and went under. Fortunately, canals aren't deep and I came to the surface quickly, coughing and spluttering, hair and weed plastered over my face. I felt a thump in my back and thrashed about madly, convinced whoever had thrown me from the bridge was hanging around to finish me off. 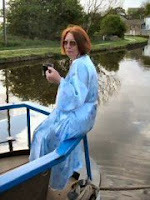 I relaxed as someone skilfully drew me in to the side of the narrow boat. Well-muscled arms reached down to grasp mine and hauled me over the side of the boat where I lay for a moment doing my best impression of a freshly caught trout. "Thank you,” I managed, as I staggered to my feet feeling like a drowned rat. I probably looked like one, too. I shivered with shock as much as with cold as the man led me down the steps and inside. "Welcome to The Mermaid's Lair. I'm Ned, Ned Oldfield, and this good lady is my wife, Alice." "Verity Long," I replied in a shaky voice as Ned wrapped a blanket round my shoulders and settled me on a chair. His wife put a mug of hot, sweet tea in my hands and I hunched over it, sipping the dark brown liquid, warming my hands as well as my insides. “How on earth did you come to end up in the canal, gal?" Ned asked having brushed aside my thanks. Thanks for featuring my excerpt, Jill. Hope you and your readers enjoyed it.